Habit: Annual 5--80 cm. Stem: decumbent to erect, simple to branched at base, puberulent, sparsely stiff-hairy, sparsely glandular distally. Leaf: 20--100(150) mm; blade > petiole, generally 1--2-compound, segments toothed. 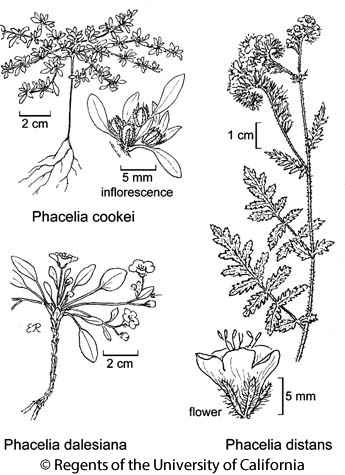 Flower: calyx lobes 3--6 mm, 4--8 mm in fruit, generally not alike, linear to ovate to oblong to oblanceolate, densely hairy, glandular; corolla 6--9 mm, funnel- to bell-shaped, throat marked with dark lavender spots opposite scales if corolla blue, spots 0 if corolla white, scales fused to filament bases, ovate; stamens 8--12 mm, included to exserted, glabrous, filaments white or purple; style 3.5--7 mm, included to exserted in flower, cleft 2/3--3/4, glabrous to +- hairy below. Fruit: 2--3.1 mm, +- spheric to oblong, puberulent. Seed: 1--2(4), 2--3.1 mm, pitted. Chromosomes: n=11. Ecology: Common. Clay to rocky soils, slopes; Elevation: < 2700 m. Bioregional Distribution: s NCoR, n&s SNF, s SNH, ScV (Sutter Buttes), SnJV, CW, SW, SNE, D; Distribution Outside California: southern Nevada, northern Mexico. Flowering Time: Mar--May Note: Plants assignable to some of the names considered here to be synonyms (e.g., Phacelia cinerea J.F. Macbr. ; Phacelia leptostachya Greene; Phacelia distans Benth. var. australis Brand) may in fact merit recognition; study needed. Citation for this treatment: Genevieve K. Walden, Robert Patterson, Laura M. Garrison & Debra R. Hansen 2013, Phacelia distans, in Jepson Flora Project (eds.) Jepson eFlora, Revision 1, http://ucjeps.berkeley.edu/eflora/eflora_display.php?tid=37450, accessed on April 19, 2019.
s NCoR, n&s SNF, s SNH, ScV (Sutter Buttes), SnJV, CW, SW, SNE, D; Markers link to CCH specimen records. Yellow markers indicate records that may provide evidence for eFlora range revision or may have georeferencing or identification issues. Purple markers indicate specimens collected from a garden, greenhouse, or other non-wild location.